Judaea, M. Ambibulus, AD 9 to 12. AE 17. M Ambibulus was a Roman Procurator in Judaea during the time of Augustus. Denomination : AE 17. 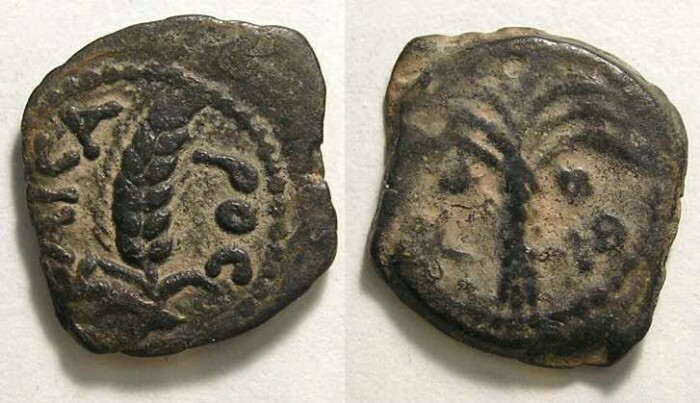 Mint : Caesarea. Date : year-39 of Augustus = AD 9 to 10. Reference : Greek Imperial Coinage #5607. Size : 15.1 x 18.7 mm. Weight : 2.53 grams. Obverse : Ear of Barly with KAICROC around (Greek for Caesar). Reverse : Palm tree with Greek L LQ to the side. The L means "what follows is a date" and the LQ means 39, thus this coin was struck in the 39th year of the reign of Augustus.